As Miele kitchens rebrands itself and takes the name of the town in which the company is based – Warendorf – it is marking this change with a new kitchen. They’ve chosen one of the biggest names in design, no less than Philippe Starck to develop the first kitchen under the new brand. 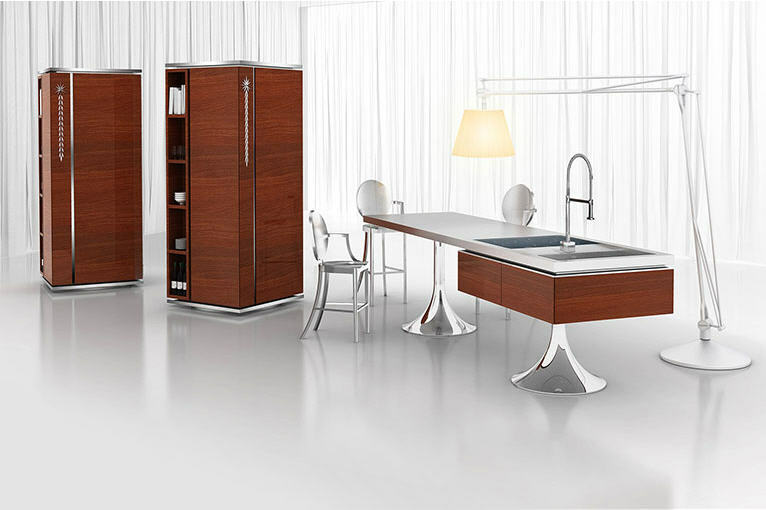 Starck has created a kitchen design that represents something of a departure, both emotionally and functionally, from the traditional wall-to-wall arrangement of fitted kitchens. He calls the concept “democratic design” because its wide range of individual elements and the ability to combine them in different ways gives it potentially wide appeal to a range of consumers, lifestyles and spaces. The name ‘Tower’ comes from the two stand-alone tower elements. Each takes up just one square metre of floor space but offers space for all kinds of accessories, food and utensils. Also integrated: oven, steam oven, microwave, dishwasher, fridge-freezer. Doors are fitted on three sides, while the fourth side is left open for individual design. The interior fittings in the towers are just as flexible as the direction in which they face. A light touch of the hand and they revolve 360 degrees, easily taking up just the position needed at that particular moment in time. Ever new. Ever different. The design of the full macoré Skyline is rounded off by elegant chrome edges and vertical recessed handles. The towers are separated into a hot tower that houses a conventional oven and a steam oven, and a cold tower that houses the fridge-freezer. However, supplementary electrical appliances such as a dishwasher or microwave, for example, can also be integrated into the towers. Both towers are closed on three sides with doors concealing the appliances. The fourth side is left open and are designed to meet the user’s personal requirements. The rear wall can be a mirror or blackboard, providing space for an enormous shopping list or a welcoming greeting for friends. 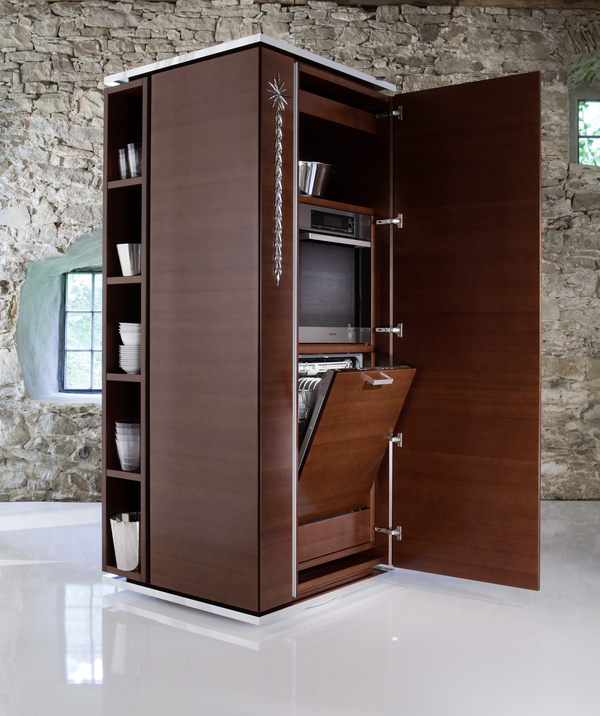 With a light touch the flexible units can be rotated 360 degrees to reveal each of the sides. The kitchen also features a kitchen island that is both beautiful and functional – what’s more, it also serves as a dining table. 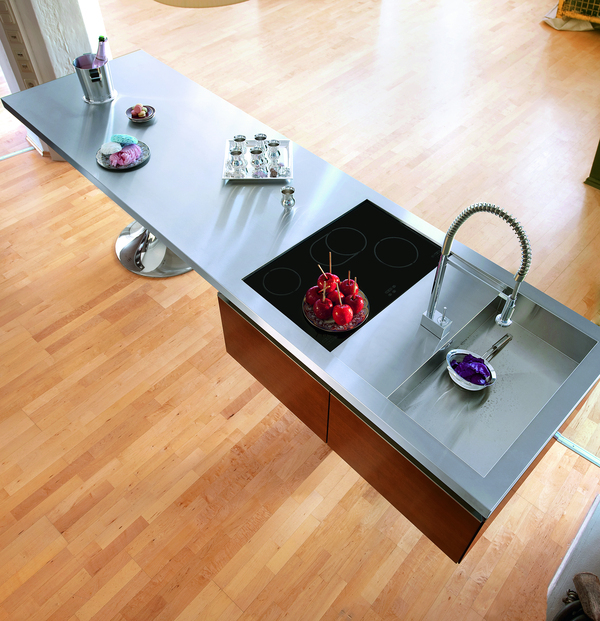 The ‘Trumpet Table’ is a so-called working module that provides preparation space, sink, hob and dining area. Storage space is located beneath the work surface.